Chances are if you've perused Facebook recently one of your meat-loving friends has declared the end of all things good in this world. That's because a new World Health Organization report found that eating processed meat may heighten the risk of colon cancer. Even worse, the consumption of other red meats probably has the same effect. The report, conducted by the International Agency for Research on Cancer, classified the consumption of processed meat in the Group 1 category, meaning the organization found sufficient evidence suggesting that this intake has a direct correlation to an increased risk for colorectal cancer. The study concluded that for every 50 gram portion of processed meat a person consumes daily, their risk for colorectal cancer rises by 18 percent. The statistics regarding red meat are a little less clear. Red meat was categorized into Group 2A, meaning that conclusions about red meat's connection to cancer were based on limited evidence. 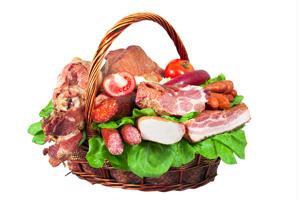 The report clarified what kinds of meat fall into each category. All types of mammalian muscle meat are considered red meat. This includes goat, veal, pork, beef, mutton, horse and lamb. Processed meat, on the other hand, refers to any meat that has gone through a transformation process such as salting or curing. These methods set out to enhance the flavor of meat and improve overall preservation but the process is what ultimately links the products to cancer. The types of meat mentioned specifically were: hot dogs, ham, sausages, corned beef, beef jerky, canned meat and meat-based sauces. "For an individual, the risk of developing colorectal cancer because of their consumption of processed meat remains small, but this risk increases with the amount of meat consumed," said Dr. Kurt Straif, Head of the IARC Monographs Programme in the report. "In view of the large number of people who consume processed meat, the global impact on cancer incidence is of public health importance." For obvious reasons, makers of processed meat were not pleased with the findings of this report. While processed meat did fall in the same category as tobacco and alcohol, the meat industry is urgently pointing out that items placed in the same category do not necessarily have the same cancer-correlating risk, reported The New York Times. The real question will be how this report affects supply chain distributors within the meat industry. If meat sales decline, the report will likely be cited as a key catalyst. As for your meat-loving friends, tell them just like everything else in life, their beloved bacon is fine in moderation. "I think it's very important that we don't terrorize people into thinking that they should not eat any red meat at all," said the Chairman of Disease Prevention at Stanford University Dr. John Ioannidis to the Times. "There's some risk involved, but it's much less than smoking or alcohol. I think it would be an exaggeration to say based on this that no one should be eating red or processed meat."